Citation Information: J Clin Invest. 2007;117(12):3774-3785. https://doi.org/10.1172/JCI32311. Loss of epithelium and subepithelial vessels after 8 days of acute rejection. (A) Radial section of syngeneic (B6→B6) tracheal graft 6 days after transplant demonstrating normal columnar epithelium. 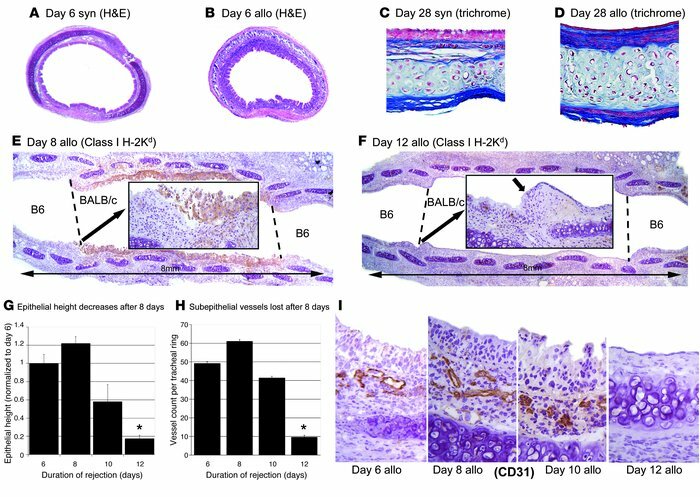 (B) Allogeneic (BALB/c→B6) graft with massive inflammatory cell infiltration of the subepithelium and epithelium 6 days following transplant. (C and D) Masson’s trichrome stain demonstrates subepithelial fibrosis and epithelial changes at 28 days in allografts as compared with normal histology in syngeneic grafts. (E) Coronal section of tracheal allograft at 8 days (n = 4) stained for MHC class I H-2Kd (BALB/c) demonstrates donor-type columnar epithelium in the graft without staining of recipient epithelium. (F) Coronal section of allograft at 12 days immunostained for MHC class I H-2Kd demonstrates replacement of columnar epithelium with flattened epithelium (short arrow). (G) Morphometric analysis of epithelial height demonstrates epithelial height loss between 8 days and 12 days. (H and I) Radial sections of tracheal allografts and corresponding vessel counts demonstrate loss of subepithelial vessels after 8 days of rejection. *P < 0.01 versus all other groups; n = 4–5 for all groups. allo, allogeneic; syn, syngeneic. Original magnification, ×4 (A, B, H, and I); ×20 (C and D).